Since 2009, Hoist Group has been the exclusive Nordic and Baltic supplier of minibars from Minibar Systems. 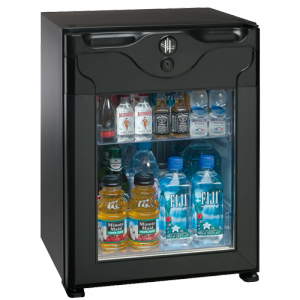 We offer a wide range of minibars in various sizes and designs, both automatic and classic models. Thanks to the innovative absorption technique, low energy consumption and eco-friendly elements, our minibars allow guests access to cold drinks without any disruptive buzzing or humming noises. The models are quick to install – simply put them in place and switch them on – making them a safe bet for all room types. 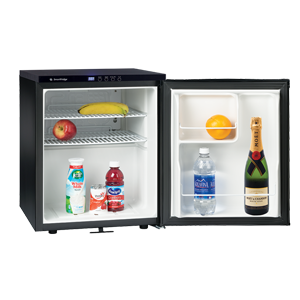 SmartFridge, an innovative new product from Minibar Systems, redefines hotel in-room convenience refrigerator technology with benefits for both guests and hotels. The LED control panel allows guests to customise their user experience with ON/OFF, SNOOZE, and QUICK COOL touch buttons. Hotels benefit from the advanced energy saving electronics that allow the unit to be shut down in vacant rooms, saving up to 50% in energy consumption. Hotels are now able to offer guests the amenities they ask for and benefit from our fundamental commitment to develop sustainable products. Read more about minibars in our webshop. A classic minibar is a minibar model without a built-in system for adding consumed goods to the guest’s bill. The classic minibar PRIMO has a generous interior and simple, elegant design. It offers consistently low energy consumption and is environmentally-friendly, as all its parts are recyclable. 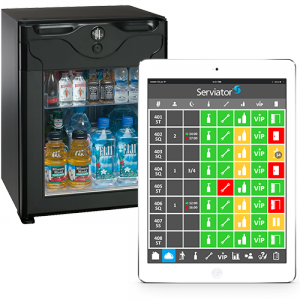 When the classic PRIMO minibar is used together with Serviator, our cloud service for task management, you get almost the same functionality as comes with a fully-automatic minibar. Consumed goods are automatically added to the guest’s bill after they are reported in Serviator. Staff can easily see what in the minibar needs to be restocked and you receive statistics on which items sell best. Serviator also gives you a host of other functions that help you optimize your hotel operations and increase service to your guests. This fully-automatic minibar has a built-in system that gives you full control over content, stock and consumption. It is equipped with intelligent infrared sensors and an interface compatible with all common booking systems, which means that goods consumed are added directly to the guest’s bill. Read more about minibars in our e-shop. 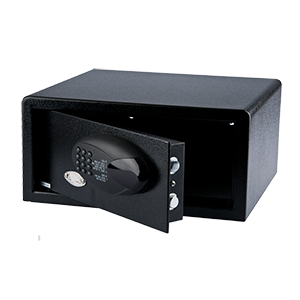 Our in-room safes are designed with comfort, convenience and security in mind and we offer a wide range of sizes and designs from iPad and laptop specifications to safes that fit inside the cabinet/drawer. Let your customers feel safe and secure during their stay at your hotel. 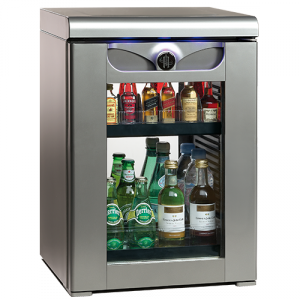 Hoist Group offers our own two standard models and Smart Box from Minibar Enterprise AG. We can also produce a safe with your unique brand colours and logo if desired. Just send us a logo request and we will provide you with art work.